I need a baby card for a co-worker--her shower is next Friday so I thought I'd better get hopping. I bought this Sweet One stamp on eBay. I know it was part of a special Stampin' Up! set, but don't know the name of the set so I'm just going to call it "Sweet One." I started with a GP white card base. Added a layer of Pretty In Pink card stock that I'd embossed with my Cuttlebug and the Swiss Dots folder. 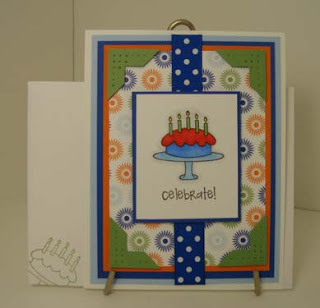 The next layer is white, on which I used the new scalloped border punch from Stampin' Up! and on which I stamped the sentiment from a Stampendous set called Baby Invites. The little foot print came from the same set. I tied a pink tiny gingham check ribbon and bow on it and added the main element--the Sweet One imagem which is up on dimensionals. 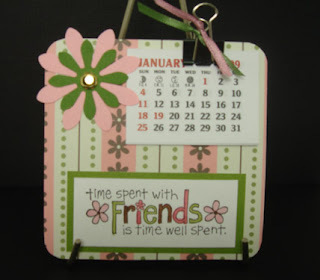 I cut that image out with a small circle Nestabilities die and I used a small scalloped Nestabilities die for the pink layer. I thought it still needed something so I added the tiny flat back pearls to the scalloped border. I think it really *is* a "sweet one." Recipe: Stamps--Baby Invites (Stampendous), Sweet One (SU! ); Paper--GP card stock, Pretty In Pink (SU! ); Ink--Pretty In Pink (SU! 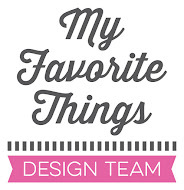 ); Tools--Cuttlebug and Swiss Dots folder, Nestabilities small scalloped and small circle dies; Accessories--ribbon (craft store), flat back pearls (Hobby Lobby), dimensionals. I love these Color Throwdown challenge colors this week!!! Cameo Coral, Certainly Celery, and Old Olive. 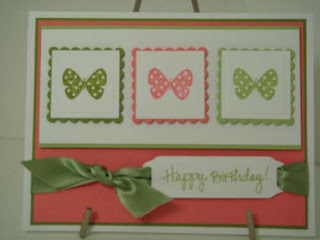 As soon as I saw what they were I knew I wanted to use these butterflies from the new Stampin' Up! Flight of the Butterflies set. And I knew how I wanted to showcase the butterflies, I just needed to work on the layout. I got them started and then went out to eat with friends, planning the whole time, LOL. I love it and I hope you do too. Thanks for visiting! Recipe: Stamps--Flight of the Butterflies (SU!) and unknown sentiment stamp; Paper--Whisper White, Cameo Coral, Certainly Celery, and Old Olive (SU! ); Ink--Cameo Coral, Certainly Celery, and Old Olive (SU! ); Tools--Cuttlebug, small square, small scalloped square, and ribbon slider Nestabilities; Accessories--ribbon (craft store) and dimensionals. When I need a masculine card I always reach for my pad of Basic Grey's Boxer paper. I love this paper!!! This card is very simple but It's exactly what I wanted it to be. Very Vanilla base card with two layers of different Boxer paper designs, topped with a layer of Night of Navy card stock. The main image sentiment is done with a stamp I got at a craft store and it works perfectly for this card--not mushy but just right for a male friend. It's stamped on Very Vanilla card stock in Night of Navy and the edges sponged with Creamy Caramel. I'm liking it! Thanks for looking! Recipe: Stamp--unknown craft store stamp; Paper--Very Vanilla and Night of Navy card stock (Stampin' UP! ), Basic Grey Boxer DP; Ink--Night of Navy and Creamy Caramel (SU!). Yep, I'm working on Christmas again :) This time, I've made ornaments from chipboard coasters. I got the idea from Laura at Scrapnextras. You can see what she did with this idea here. In past years, I've put an artificial prelit evergreen garland over the double doors that lead from our dining room into our office and hung Christmas cards on it. This year I'm doing something different. I'm going to decorate that garland with a "Let It Snow" theme. 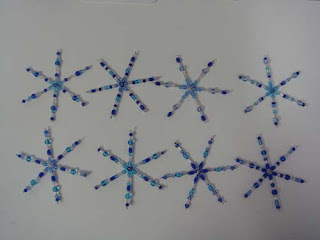 To this end, I've made some beaded snowflakes and icicles using shades of blue, and embellished chipboard coasters as ornaments. I didn't have a snowflake background stamp so I made one. 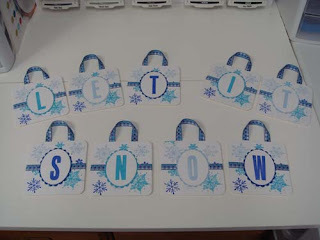 I used the individual snowflake stamps from a set from Paper Studio and placed them randomly on a large acrylic block. 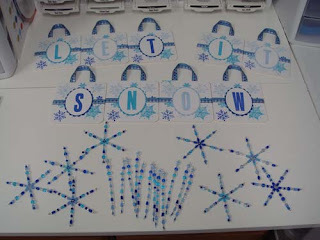 I inked the snowflakes with my Stampin' Spots in Tempting Turquoise, Brilliant Blue, and Bashful Blue. I also stamped the letters in these colors with a retired SU! alphabet set on oval pieces I'd cut with my Cuttlebug and small oval Nestabilities. I then pasted the coaster (just smeared a glue stick all over it) onto the stamped paper and trimmed off the excess. Then I put a strip of ribbon that matches the colors perfectly. I got this ribbon at A C Moore months ago with no purpose in mind, I just liked it. Next, I cut borders in those three colors with my small scalloped oval Nestabilities. Glued them in place and made a hanger with the ribbon. So easy and, I think, so cute! 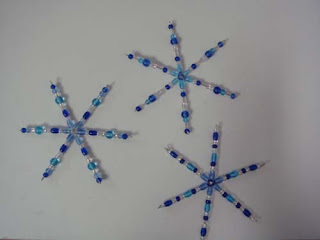 The snowflakes were done on snowflake forms and I used heavy beading wire for the icicles. They all match very nicely with the coaster ornaments. The Color Throwdown challenge colors for this week are Ballet Blue, Bashful Blue, and Apricot Appeal. I decided to use the Meet The Verve Diva sketch challenge layout over at Splitcoast Stampers and this is what I came up with. My base card is Bashful Blue, followed by a Ballet Blue layer and an Apricot Appeal layer that I ran through my Cuttlebug with the D'Vine Swirls folder. The next element is an Apricot Appeal layer that I stamped in Apricot Appeal with my Stitched background stamp, but it doesn't show up well in this picture. That is layered on a Ballet Blue layer that I ran through the Cuttlebug with a long rectangles Nestabilities die. The sentiment element is stamped on Whisper White with a stamp from the Always set, layered on Ballet Blue and then Bashful Blue cut with Nestabilities dies, too. A blue satin bow and some brads finish it off. I'm going to use this for an anniversary card. Hope you like it! 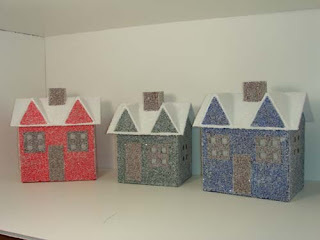 Recipe: Stamps--Stitched background and Always set (SU! ); Paper--Whisper White, Ballet Blue, Bashful Blue, and Apricot Appeal (SU! ); Ink--Ballet Blue, Bashful Blue, and Apricot Appeal (SU! ); Accessories--ribbon and brads (craft store); Tools--Cuttlebug and D'Vine Swirls folder, long rectangle, small circle, and small and petite scalloped Nestabilities dies. My brother-in-law is a musician and his birthday is coming up. This card is for him. I bought this patterned paper and the music note brads months ago with this card in mind, and I got the Cuttlebug folder recently, also for possible use on this card. But I think it could easily be used for a Christmas card, too. (How's that for rationalization, LOL?) I CASE'd this card of Tammy's at Stamp Happy for this card. I started with a Basic Black card base. I try to avoid dark card bases because then you have to line the inside, but nothing else would do for this card. The silver metallic paper, that is the next layer, came from Office Max, believe it or not. It has a matte finish and embossed nicely. 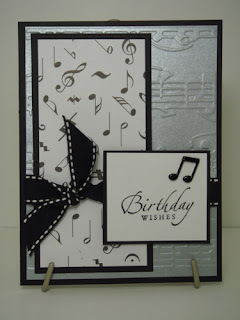 The main element is a music note patterned paper that came from a craft shop--either Michaels or Joann-layered on more Basic Black card stock. Then, black double-stitched ribbon was tied around. The sentiment element was stamped using Sincere Salutations and Basic Black ink on Whisper White and matted with Basic Black. The music note brad came from a craft store. I'm happy with it. Thanks for looking! Recipe: Stamps--Sincere Salutations (SU! 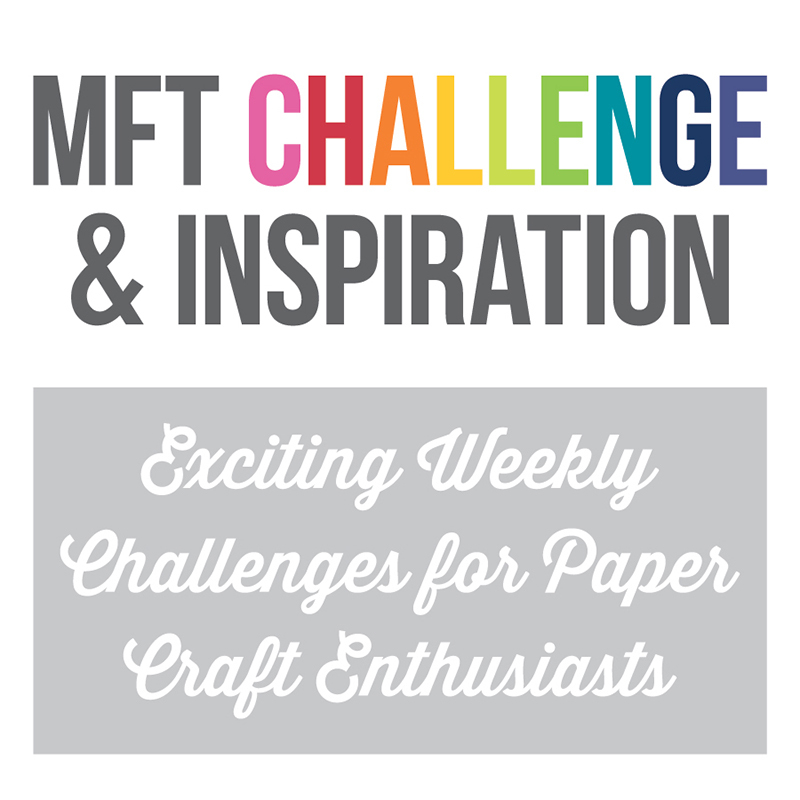 ); Paper--patterned (craft store), Whisper White, Basic Black (SU! ), silver metallic (Office Max); Ink--Basic Black (SU! ); Accessories--ribbon, music note brad--craft store; Tools--Cuttlebug and Allegro folder. The kid a couple of doors up the street is getting married next month (can't believe that--she's still 5 years old, right?) and I decided not to wait until the last minute to make her card. I'm so good, I've already got her gift, too!! Her colors are black and green so I made her card with those colors in mind. 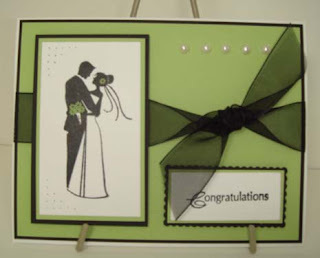 On a GP white card base I layered Basic Black and Certainly Celery (I so love that color!!) and tied a sheer black ribbon bow on. The focal image is stamped with a stamp from the Inkadinkado set Wedding, as is the sentiment. I colored the bouquet flowers with my Certainly Celery marker to spice that up a little. The main image is layered on Certainly Celery and then Basic Black. Same for the sentiment image but I used a long rectangle Nestabilities die for the black layer to add a little interest. Flat back pearls at the top and some paper piercing on the main image corners balance it a bit and it's done! Elegant, I think. Thanks for looking! Recipe: Stamps--Inkadinkado Wedding; Paper--GP white, Basic Black and Certainly Celery (SU! ); Ink--Basic Black and Certainly Celery (SU! 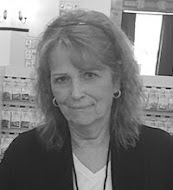 ); Accessories--black sheer ribbon (Wal*mart), flat back pearls (craft store); Tools--Nestabilities dies. Wow! This one was a toughie! 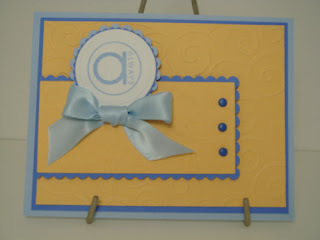 I started with Barely Banana card base (can you believe it--not white or Vanilla, LOL!). The next layer is Pumpkin Pie which I ran through my Cuttlebug with the Stylized Flowers folder. 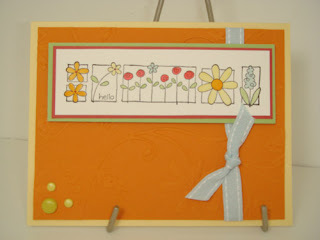 The focal image uses a stamp from the Stampin' Up! A Little Bit of Happiness set which I watercolored in the required colors using stamp pads and markers. That was layered on Ruby Red and then Certainly Celery and attached using dimensionals. The ribbon is Soft Sky double stitched ribbon and the craft store brads, even though they look green in the picture, are a perfect match for Barely Banana. I think I got all the colors represented, LOL! Recipe: Stamp--A Little Bit of Happiness (SU! ); Paper--Barely Banana, Pumpkin Pie, Ruby Red, Soft Sky, and Certainly Celery (SU! ); Inks--Basic Black, Barely Banana, Pumpkin Pie, Ruby Red, Soft Sky, and Certainly Celery (SU! ); Accessories--Soft Sky double stitched ribbon and soft yellow brads (craft store), dimensionals; Tools--Cuttlebug and Stylized Flowers folder. This card is for a very special friend. I started with a white base card. The next layer is Basic Black on which I used a Fiskars border punch and embosser and on which I attached flat back pearls as accents. It was attached leaving room for the sentiment on the card base. The next layer is Brocade Blue which I ran through my Cuttlebug using the Stylized Flowers folder. The focal image--and sentiment--is stamped using the Inkadinkado Wedding set and attached with dimensionals. I highlighted the rings with a Sakura glitter pen. 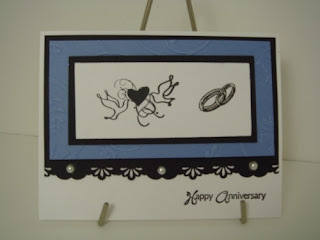 Recipe: Stamps--Inkadinkado Wedding set; Paper--Basic Black and Brocade Blue (Stampin Up!) and GP white; Ink-- Basic Black. Accessories--flat back pearls (craft store) and Sakura glitter pen, dimensionals; Tools--Fiskars border punch and embosser, Cuttlebug and Stylized Flowers embossing folder. I needed a sympathy card and this is what I came up with. Started with a white base, layered with Not Quite Navy, which I double scored all around with my ScorPal, and Bashful Blue, over which I put a strip of blue satin ribbon--which matches the Bashful Blue paper perfectly. The focal image was stamped with Whisper White craft ink on Not Quite Navy with Flourishes Damask stamp and matted with GP white card stock. I really like this stamp--very versatile. Then it was heat embossed with iridescent embossing powder and attached with dimensionals. Pretty simple but I like the way it turned out. Thanks for looking! 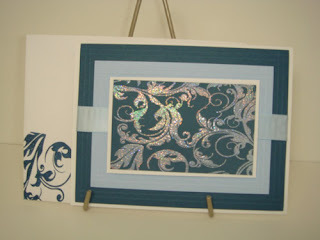 Recipe: Stamp--Damask by Flourishes; Paper--Not Quite Navy, Bashful Blue (Stampin' Up!) and GP white; Ink--SU! Whisper White craft; Accessories--craft store ribbon, dimensionals, iridescent embossing powder; Tools--heat gun, ScorPal. More Christmas preparations! Yes, I am a Christmas nut and this *is* a paper project. I found these houses at Hobby Lobby. I guess they're considered papier mache'. The first step was to prime them and I used Kilz. Then I painted them the colors I wanted with Folk Art paints: pastels for the living room and primary colors for the library. At first I was going to leave the window and door openings alone, but decided I'd regret that after I'd covered them with glitter, so I made some doors from chipboard coasters and glued them on. I covered the inside of the window openings with vellum card stock and made window frames from card stock (SU! Chocolate Chip for the brown ones and GP card stock for the white ones). I ran them through my Xyron X sticker maker--easier than gluing each little part of the frame. I had to cut an opening in the bottom of the house so I could get my hand in to attach the vellum. 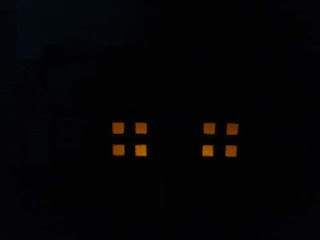 At first I was going to cut a hole in the back so I could put a light in the house, but a friend suggested that might get too hot and suggested a battery operated tea light. Smack me upside the head--why didn't *I* think of that, LOL! It works like a charm--the third picture shows how they light up the vellum with the room lights on low. Then, I diluted Elmer's glue (simply because I have a lot of it sitting around, LOL) about half and half with water and brushed it on with a sponge brush, doing one side at a time. Holding the house over a large clean tote, I started sprinkling clear glitter on it, very heavily, then tapped off the excess. 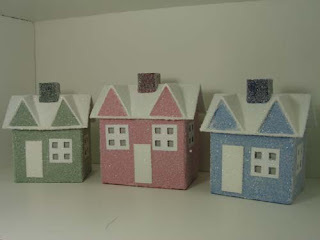 The first picture shows the pastel colored houses that will go under my Victorian Elegance tree in the living room and the primary colored ones will go under my Hallmark Traditions tree in the library. I'm going to bleach and dye some bottle brush trees to go with the pastel ones and use the dark green ones with the primary colored trees. I like 'em! Yeehaw! Another project marked off my to do list. I CASE'd this card from Cambria at Stamp a Little Love Baby. I love the Jersey Shore collection from the mini catalog! 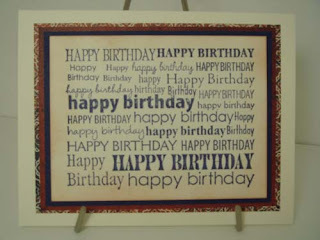 Been wanting to use it, too, so I pulled it out to make this birthday card with my Just Celebrate stamp. I started with a white card stock base (of course, LOL), then added Bashful Blue, Brilliant Blue, and Pumpkin Pie card stock layers, topped with a layer of the Jersey Shore DP. 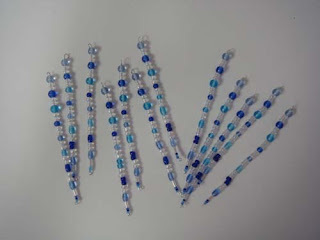 On this, I attached a strip of bright blue polka dot ribbon. The focal image was stamped with Brillance Graphite ink and colored with Copics. Then it was matted with Brilliant Blue card stock and attached with dimensionals. It needed something else, so I punched out some photo corners from Wild Wasabi card stock, pierced them, and added them to the DP, also up on dimensionals. I like it and I hope you do, too. Thanks for looking! 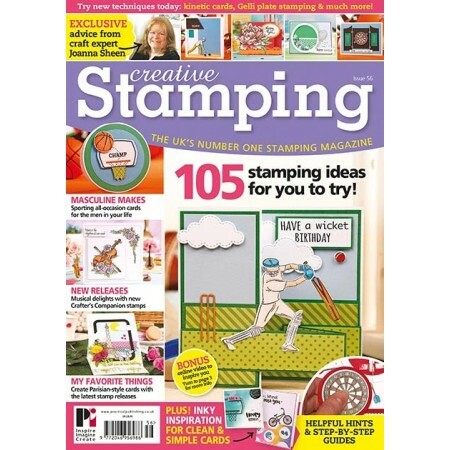 Recipe: Stamp--Just Celebrate (SU! ); Paper--GP white, Stampin' Up! Bashful Blue, Brilliant Blue, Wild Wasabi, and Pumpkin Pie along with Jersey Shore DP; Ink--Brilliance Graphite; Accessories--Copic markers, photo corner punch (SU! ), paper piercer, ribbon (craft store). I've been wanting to use this Annie LaPoint stamp from My Favorite Things ever since I saw Tammy's sample for Color Throwdown challenge #4. This card starts with a white base card. Seems most of mine do--I just like a white (or vanilla) base, what can I say? Anyway, a white base, followed by a black layer, on which I've stamped the sentiment with white craft ink. The next layers are Certainly Celery and Lavender Lace. The focal image is stamped with Basic Black and colored with Certainly Celery and Lavender Lace markers and layered on Basic Black, Certainly Celery, and Lavender Lace card stock. Flat back pearls for accent finish it off. This was a fun card, too. Thanks for looking! 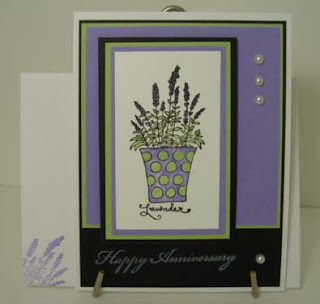 Recipe: Stamps--Lavender (My Favorite Things), Happy Anniversary (unknown); Card stock--GP white, Basic Black, Certainly Celery, and Lavender Lace (Stampin' Up! ); Ink--Basic Black dye and Whisper White craft and Certainly Celery and Lavender Lace markers (Stampin' Up! ); flat back pearls (craft store). I had fun making this birthday card. I started with a GP white card base, then a layer of Old Olive card stock topped with a layer of paper from the Basic Gray Sugared 6 x 6 pad. The next element is a layer of Old Olive with a Pretty In Pink layer. The focal image is a stamp from the Hero Arts set Sweet Moments, as is the sentiment. The focal image is colored with Copics after being stamped on GP card stock. I added a little glitter with a Sakura glitter pen on the cheries and attached it with dimensionals. Then, a little paper piercing, a couple of craft store brads, and craft store ribbon and hardware and it's done. Thanks for looking! 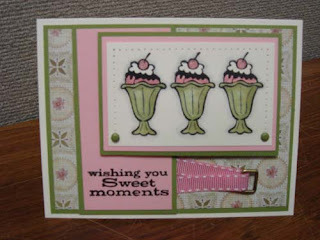 Recipe: Stamps--Hero Arts Sweet Moments; Card stock--GP white, Old Olive and Pretty In Pink (Stampin' Up! ), Basic Grey Sugared paper; brads, ribbon, and hardware--craft store; Tools--paper piercer, Craft Mat and Stamp-a-ma-jig (SU!) and Crop-a-dial. I've started working on some Christmas gifts. Time is flying and I wanted to make a bunch of these little calendars for stocking stuffers or a hostess gift or to keep on hand when I just needed a little gift. I got the idea from my friendly SU! demonstrator and friend, Betty. I pasted craft shop scrapbook paper on square chipboard coasters that I got on eBay, added a sentiment that was stamped with Stampin' Up! stamp from the Time Well Spent hostess set and colored it to match whatever paper I used, added the calendar that I got from Vippies with a spring binder clip embellished with little scraps of matching ribbon and attached punched out flowers with a brad. It has an easel back that I got from Reuels so it can be set on a desk. So easy and so cute! Fresh Cut Color Throwdown #5. I needed a card to send to a friend and I needed one for this week's Color Throwdown challenge so this is it. The colors this week are Wild Wasabi, Purely Pomegranate, and So Saffron. When I first saw them they shouted "FALL" to me, but I resisted so I could make this card that I needed. I really love the Fresh Cuts set. I didn't put a sentiment on the card because the main image has "thinking of you" all over it and thought that sufficed. Also, I limited the embellishments since the main image is so detailed. The base card is white, with the three challenge colors layered on top. I colored the main image with a So Saffron marker and watercolored the leaves with my Wild Wasabi reinker. The main image is layered on Purely Pomegranate card stock and is up on dimensionals, although you can't tell that from the picture. The only embellishment is Purely Pomegranate double stitched ribbon. I stamped a smaller image from the set inside the card and another on the envelope. Thanks for looking! Recipe: Stamp--Fresh Cuts (Stampin' Up! 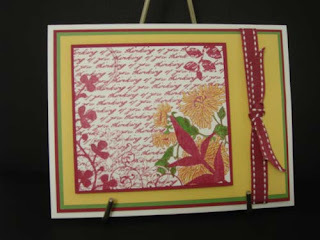 ); card stock--white GP, Purely Pomegranate, Wild Wasabi, and So Saffron (Stampin' Up! ); Ink--Purely Pomegranate, Wild Wasabi, and So Saffron marker (Stampin' Up! ); Accessories--Purely Pomegranate double stitched ribbon.